Chatbots are computer programs which have access to real conversations with users via a chat interface. Today, chatbots are used with almost all popular messaging apps. The chatbots can understand text both written and spoken and interpret its meaning to deliver relevant information to the user. Being a machine, chatbots do not have any limitations like human and can operate without an upper limit. Whereas, the agents can handle limited conversations at a time. Thus, with the chatbot solutions, a business can increase the task force and can enter in the competitive markets easily. When the talking bot is first points of contact, it can reduce a load of your customer support team by screening the calls from customers. Thus the filtered calls will save the time of human agents and that can be used for quality purposes. It's a matter of fact, the more you interact with your online customers, there are more chances to get business. Hence, using chatbots can be the best option for active marketing for the online customer. Chatbots are the cheap source for a highly interactive marketing campaign. With the availability of chatbots on platforms like Facebook Messenger can help to hit more people at the single point in time. There is no need to employ more people for mundane and repetitive tasks. By installing a chatbot business solution, your business can be automated in a systematic manner. One of the highly preferred server-side language for creating the backend of a chatbot that supports all the functionalities and ensures quick and easy access to the app information and services to the users. Python, one of the best programming language has multiple interesting features. It is an interpreter, high level, and object-oriented programming language, which makes it ideal for creating chatbots. The English keyword of this language makes it readable and also has the syntactical construction in comparison to other programming languages. 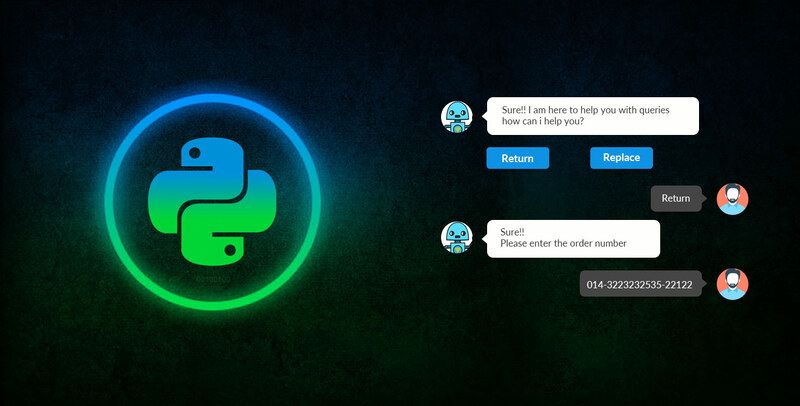 In chatbot development process python is used for creating Chabot as it offers simple syntax. Moreover, using Python you can develop chatbot having GUI application, i.e created and ported to many systems calls libraries and Windows system. And if you want the better structure that can support large program than Shell Scripting, then python is among top preferences. Chatbots are one of the top application created using python language. With the rising need to meet the challenges of modern lifestyle and frequent demands for chatbot development services, nowadays most of the leading companies like Facebook, also have chatbot for their messenger. Facebook Messenger treasures more than 30,000 bots. For example; there's a chatbot for Facebook Messenger which can suggest a recipe for you, what you need to do is simply mention one grocery item, rest this AI chatbot will manage itself. In this modern era, chatbots represent a new trend in how people access information, take decisions and then make communication, either it’s for the personal or business purpose. Thus, chatbots provide a great opportunity for different industry verticals to increase sale. Hire chatbot developer, from a renowned bot development company for your next project and boost your ROI to the maximum. NEXT POST What is Internet of Things and How it Works?